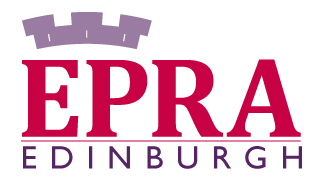 The final detailed Agenda for the 45th EPRA meeting, which will take place on 17-19 May in Edinburgh is now available. The conference, hosted by Ofcom, the convergent communications regulator in the UK, will gather about 160 delegates representing 50 member authorities. Following the adoption of the EPRA Work Programme, the plenary sessions in 2017 will address News in the Digital Age (Plenary 1) and Promises & Challenges of Digital Disruption (Plenary 2). The Plenary Session 1 which will take place on 18 May will focus on access to content and news, by looking at plurality of provision, how measurements of news consumption are made and by examining levels and issues of trust among viewers. The keynote speaker will be Chris Banatvala (Bear Consultancy). A panel discussion will include Gary Smith (BBC Scotland); Simon Milner (Facebook) and Sejal Parmar (OSCE Office of the Representative on freedom of the media). The impact of personalized recommendations on diversity will be the focal point of the Plenary Session 2 which will convene on 19 May. After a introduction by Prof. Dr. Natali Helberger of the University of Amsterdam/IViR, a panel composed of Olivier Schrameck, President of the French CSA; Judith Möller of the University of Amsterdam and Anne Schuth of the Dutch start-up Blendle, will debate on whether filters and algorithms represent a threat or an opportunity for media diversity. The first WG will look at look at a range of recent Media literacy initiatives undertaken by different types of stakeholders with a particular focus on projects aiming to the development of critical thinking. We are expecting a lively session with input from Alison Preston, Ofcom (UK); Maja Cappello, European Audiovisual Observatory; Stéphane Hoebeke, RTBF (BE) and Michael Nicolai from AMARC Europe. The main focus of WG2 will be on best practices and practical difficulties encountered by regulatory authorities with Licensing and Authorisation Procedures for linear audiovisual media services. After an introductory presentation by Gilles Fontaine from the European Audiovisual Observatory, participants will discuss the variety of approaches, potential benefits in aligning some approaches and issues of practical cooperation. For the third WG, participants will gaze into their crystal ball for "The Future of Radio". Line Langnes from the Norwegian Media Authority will report on the FM switchover process currently ongoing in Norway and challenges faced by the regulator. Ben Poor (EBU) and Matt Payton (AER/Radiocentre) will share their views with the participants on the future of radio. EPRA Meetings gather the 52 EPRA members, as well as permanent observers of the network. The participation is possible only upon invitation. Further details on the Agenda can be found in the attachment below.